Private Henry Croom was born in Southwell, Notts in 1893 2, a son of Thomas & Katherine (née Curzon) Croom3, part of a family of eight surving children. By 1911, the family had moved to Beeston, from Newark where all except Henry had been born, and were living at 4 Union Street, Beeston, with four of the children still at home. George Croom worked as a labourer at Beeston Foundry and Henry was also working there as a moulder.4. Having enlisted with the Sherwood Foresters on 31st August 1914 and, after a short period of initial training, Private Croom was part of a contingent of 1st Battalion which embarked for France on 27th December 1914 5, arriving in the trenches in the middle of winter when conditions were appalling. On May 9th, his company took part in an offensive against heavily defended enemy lines, together with units of the East Lancashire Regiment. Shelling before the attack had been expected to have cleared the way but tragically, this was found not to have been effective and only a small gap had been made. Faced with strong enemy machine gun fire there were many casualties before the attack was called off, but not before more casualties were suffered as a result of enemy heavy artillery fire 6. Private Croom was wounded by gunshot to his chest during this offensive and was moved to a military hospital in St Omer six days later, where he died of his wounds on 20 May 19157. He is buried in the military cemetery in Le Treport. In the months that followed and for the next few years, his family had to face the harrowing task of receiving, first his small quantity of personal belongings and then his medals - 1914-15 Star, British & Victory Medals - and the bronze Memorial Plaque (popularly known as the "Dead Man’s Penny") that was issued the the next-of-kin of British and Empire service personnel who were killed. His mother also received his backpay of £5 13s 10d and, in April 1919, a War Gratuity payment of £3.8. Le Treport Military Cemetery 9 - lies to the south of Le Treport, a coastal town approximately 30 kilometres north-east of Dieppe. By March 1915, the town had become an important hospital centre with three military hospitals. A further two hospitals, established in June 1915 and July 1916, brought the total number of beds to nearly 10,000 and it was to grow even more by the end of the war. 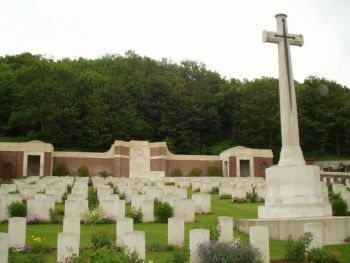 There are now 445 Commonwealth burials of the First World War and four Second World War burials, three of then unidentified, in the cemetery. 2Newark Registration District Q3/1893 Ref 7b 430. His age at death appears to be recorded wrongly (as 26) on his Commonwealth War Graves Commission record. 3Thomas Croom (b Newark, Notts c1860) married Katherine (also known as Kate and Catherine) Curzon (b, Newark, Notts c1865) at Newark, Notts in Q4/1880 (Newark Registration District Ref 7b 673). 4Thomas and Katherine had 10 children, of which 8 were alive at the time of the 1911 census. Emily (b c1883) and Alfred (b 1885) had moved away from home, leaving Robert (b. 1888). Kate Elizabeth c. c1892, married to Alfred Brewster), Henry, Daisy (b. c1896), Leonard (b. 1898 and Florrie (b. c1902) were then living with their parents at 4 Union Street, Beeston (1911 Census - Piece 20431 RD429 SD3 ED6 Schedule 131). Later entries in his Service Record indicate that the family later moved to 6 Union Street, Beeston. 5His Service Record has survived, showing that he enlisted at Nottingham. 6This account of offensive operations on 8th - 10th May 1915 is based on a report contained in the War Diary of 24 Infantry Brigade, 1st Battalion, Sherwood Foresters. 7His place of death is recorded in the Army Register of Soldiers' Effects as "No 10 Sta: Hos: St Omer"
8This process is documented in Private Croon's Service record. Particularly poignent is the list of his personal possessions - a disc, a chain with medal and coin attached, a broken purse, a damaged watch, a 'title', religious books, a writing case and some post cards. More information on Memorial Plaques is at https://en.wikipedia.org/wiki/Memorial_Plaque_(medallion). Details of backpay and gratuity are from Army Register of Soldiers' Effects (record no 171189).